Beautiful vintage Greek Christening invitations for baby boy or baby girl. 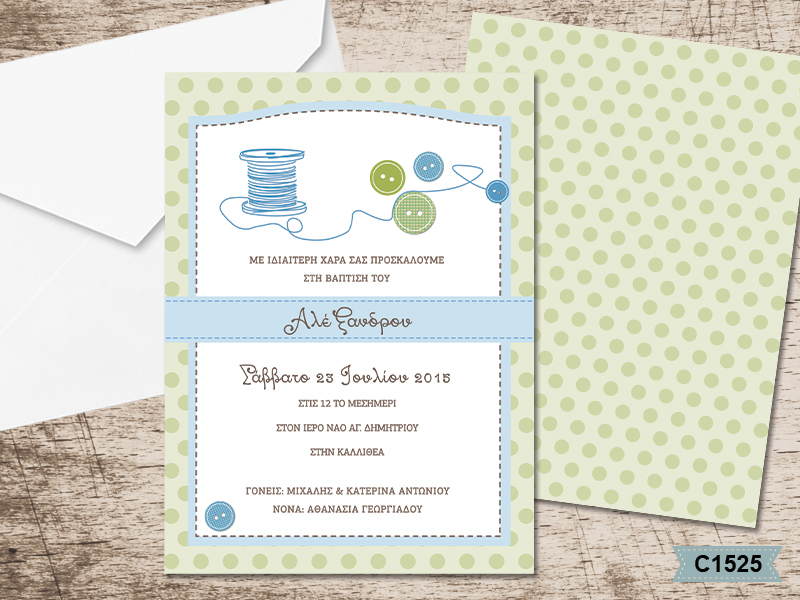 This invitation is coming in a polka dots pattern paper in light green color, with baby blue bobbin and buttons, and a baby blue striped message with the baby's name on. The colors can be change upon request in baby pink, for girls. The matching envelopes are white, and your personalized wording is printed in plain black color. https://www.preciousandpretty.com/2017/05/personalized-greek-baptism-invitations-for-boy-or-girl-C1525.html Greek Wedding Favors|Orthodox Crowns|Stefana|Baptism Invitations Personalized Greek Baptism invitations for boy or girl C1525 Greek Baptism invitations with baby's name, for boy or girl Product #: Greek Wedding Favors|Orthodox Crowns|Stefana|Baptism Invitations_6306482390573695941 5 stars out of 5 reviews.